Anyone knows the exact time when the application is due? Couldn't find it anywhere on Foster's website. I am posting here summary of the chat we had recently with Megan Lewis - Associate Director of Admissions at UW Foster - and Nelson Tang - Current Foster MBA Student. Those who want to view full chat transcript can download it from this post. Next chat session with Foster admission team is on November 03. Good luck! Nelson, Can you tell us about your background, post MBA goals, and why you chose Foster? Is it true that mba students don't have much interaction with Center For Sales and Marketing Strategy? You'll find a list of companies that have hired our students for marketing roles among other resources that Foster offers students pursuing careers in marketing. I noticed that the resume can be up to 3 pages long. While it is the Max Limit, what is the preferred page-limit that you typically recommend? Foster_Megan: There is no optimal length, but we are interested in seeing any work experience and extracurricular activities or volunteer experience from the 1st year of university onward. If you are planning to make a career transition, it is helpful to tailor your resume to demonstrate that you have the skills to do so. Any activity demonstrating leadership and commitment to community is positive. Hi Nelson,Are strategic consulting project and Applied Strategy Consulting project same or there is some difference. Can you please share your experience on these? Foster_Nelson: I think those are the same. If you're referring to the consulting project that we do in the first year, it was a great experience to immediately apply what we learned in the first quarter. Towards a meaningful business challenge that a company is facing for my project, I did marketing strategy for EMC's Big Data analytics. it was a subject I have no prior knowledge or experience with, and it was great to really learn about their industry and to interact with people at EMC. Our final brief was to senior leaders at that company, and was a great learning opportunity! In second year also do we get any chance to work on any similar live project. Hi Nelson, Your marketing strategy project at EMC big-data analytical sounds interesting. Based on your experience, Can you let us know how challenging is the process of applying/getting marketing jobs/internshhips in industries where one might not have direct previous experience but can be open and willing to get into? Foster_Nelson: It's really tough depending on your background. we have a former ski patroller and a folk singer who completely changed their career paths. The career services team is SO amazing at helping you frame your experience and tell your story to new audiences. Our folk singer had some weird-sounding things on her resume, but thanks to career services, she was able to land an amazing marketing internship. Foster_Megan: We are ranked #3 in the US in job placement. 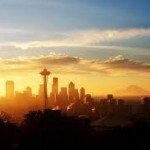 Seattle is the fastest growing city in the U.S. and we have a small MBA program, which helps, but the program won't accomplish your career goals for you. It's your responsibility to take full advantage of the resources, network, do your homework, build your interview skills, etc. What options are available for international students for interviews? Do you connect applicant with local alumni? Foster_Megan: There is an international alumni group that is available as a resource for current international students. MBA Career Management knows which companies offer sponsorship. We've actually had a 100% job placement rate for international students for the last 3 years. MBA Career Management offers assistance in terms of cultural issues that may crop up as well. Could you please shed some light on the scope of Internationals to obtain overseas employment in US post MBA, especially considering the current H1B restrictions? Foster_Megan: Until now, only one of our students did not get the H1B through the lottery after completing the first year of employment on OPT (F1) status. That's in the last three years. All other students were hired on F1 status and converted. Can you shed some light on employment process. What support do students get from career services team during internship/employment. Which companies, and from which sector, generally recruit at Foster? How much should we elaborate on our personal interests in the resume? Are you looking for more in depth than just a bulleted list? Foster_Megan: If they are minor hobbies, a list is fine. If your personal interest has resulted in awards, travel, leadership responsibility, professional development, etc. you may choose to give a bit more detail or if the experience has been more significant, you might use the optional essay space to talk about it. In most cases, a bullet or list is fine. Have you done any international consulting project? How is it different from study tours? Is only Evening MBA option available for those want to apply for Part time program? Or do you have weekend program too? Foster_Megan: Foster has 3 work-compatible programs: Evening MBA, Technology Management MBA, and Executive MBA. TMMBA has classes on Saturdays and one evening/week. Executive has two different schedules. One schedule includes full-day classes alternating Friday and Saturdays. How can a candidate highlight notable achievements (on a professional / personal level) that may come in after the application has been sent in, but before the decision has been made? I understand it may make things harder for Adcom, but is there a preferred way of managing this? Foster_Megan: If you have achievements to share after submitting the application, you can email us an updated resume, but there is no guarantee that your update will be considered. It depends on where we are in reviewing your application. In for round 1! Good luck everyone. Hi! Can someone help me with a very important question at this time! I just submitted my Round 1 application to Foster. however the GMAT scores have not been sent yet- although I have self reported my scores. I sent an email to the mba admissions team- but can anyone tell me if they will still consider me for round 1? :///// would greatly appreciate any reply! THANK YOU SO MUCH for your reply! And since I have you here how about the optional essay? I did not submit one but it appears as "not received"! ;/ Thanks again for your prompt reply! Both my "optional essay" and "MBA/JD" essay appear not received (I didn't submit any). The admission office says it's ok to leave them blank. Any idea, when will we hear back from school on Interview? Looking at last year's thread, we will probably hear back in about a week. As to the GMAT, I submitted my app on the 14th and today it shows my GMAT scores have been received. It hadn't been received when I checked yesterday. I just received an email Thursday saying my application has been moved into review phase, and with info on interview invites and decision dates. So seems like they're still reviewing. Anyone else? I got the same e-mail on Thursday. Just speculation, but if they're reviewing now, seems like they should be starting to offer interviews this week. Foster, why you got to keep me waiting? Really hoping to make a trip to Seattle! Looking at last year thread, interview invites started coming on Oct 22nd. So I presume we are not far from the time when interview invites will start coming.... Eagerly looking forward to it.. Received a video and in person interview invite today. Pretty pumped! Good luck to everyone! I did too, both video and in person. Good luck to you also!